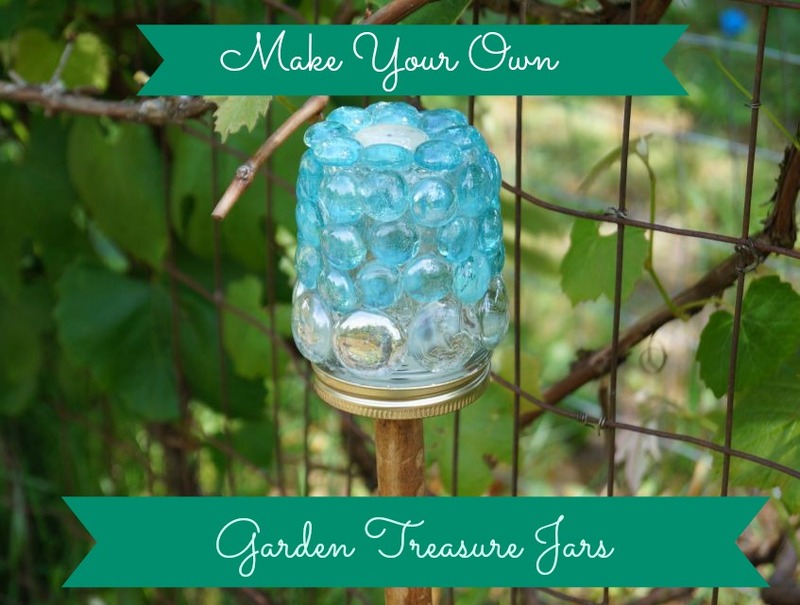 While browsing through gardening ideas on Pinterest one day, I found this adorable post on making your own garden treasure jars from the Empress of Dirt. “That looks easy enough, I can do that” I thought to myself. 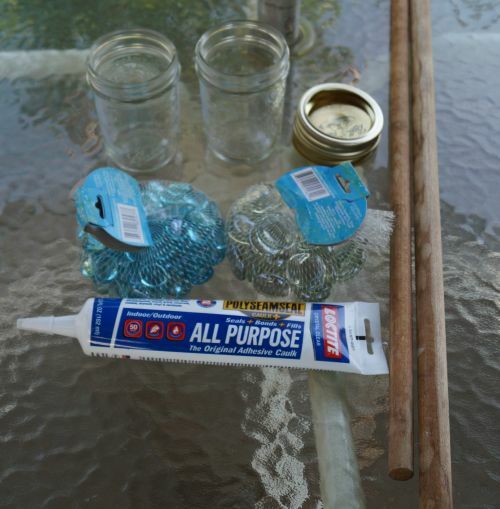 I had mason jars, lids (I do believe any used jar with a lid will work though) and dowels on hand. All I was missing were the flat marbles and some clear silicone sealant. 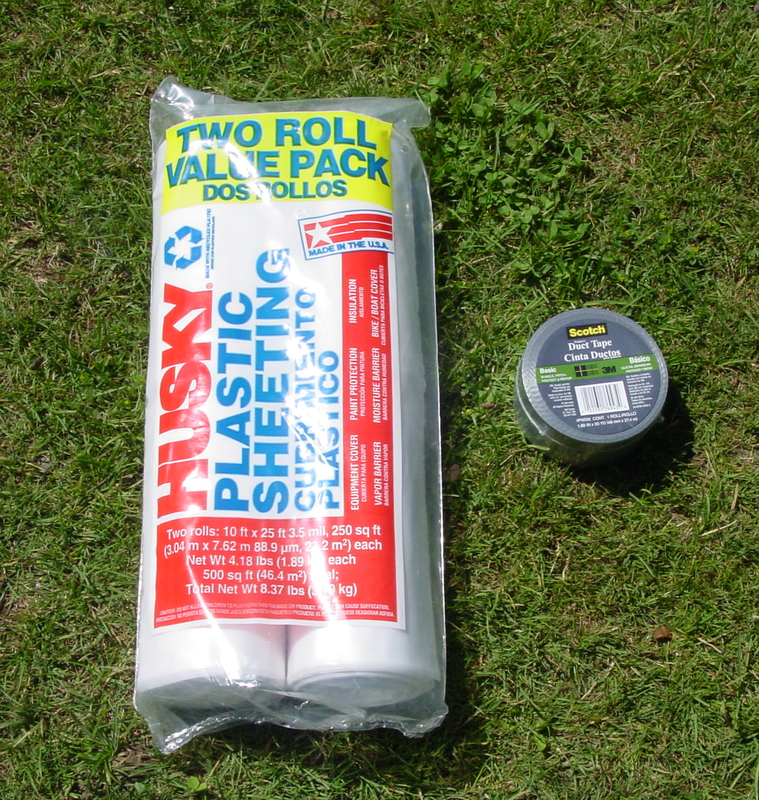 So off I went to Lowe’s to get the sealant and the Dollar Tree for the marbles. Once I got back I was ready to do some crafting. My kids were eager to help too. My BIG mistake: I didn’t read the Empress’ post well enough. She specifically says to get the GE II Silicone Sealant, clear, waterproof. I didn’t do that. I got a (cheaper) brand called Loctite, but hey, it was clear, so there was that. What happened next could have easily turned this experiment into a Pinterest fail. 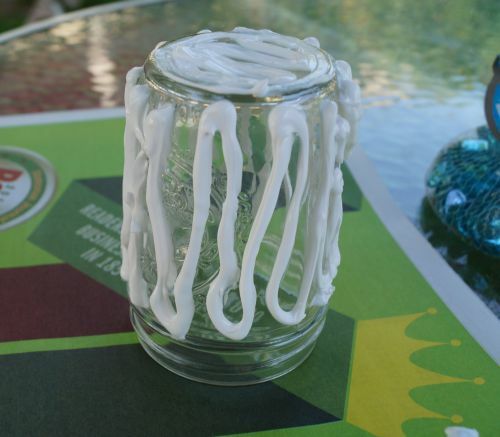 I liberally slathered the sealant on the jar, just like in the picture on the other post. Then we added marbles one by one. This is where the wrong sealant played a huge factor. The marbles were not sticking well at all. They were sliding off and falling off, one by one. It looked disastrous. I was trying to catch them and put them back on, meanwhile, another would fall off, then another. Plop, drop, plop went the marbles. Not to mention the sealant was getting on my fingers and the marbles and my kids fingers. Ack! I wasn’t even thinking of taking a picture of this part, but you can imagine the awful mess. I didn’t give up though. 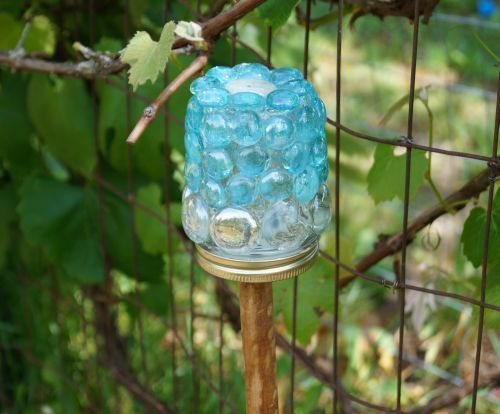 I patiently kept re-adding them on, until the jar was full of marbles and set it aside. This did not stop the marbles from plopping off. I just stuck them back on as needed and proceeded to try my second jar. This time, I decided to place a droplet of the sealant on the marble instead of slathering it on the jar. WRONG! This was worse than the first experiment. The marbles slid down the jar immediately. So I did another sticky, marble juggling act to get them all on and set it aside. Needless to say I had to keep checking on it often to reposition the marbles. Luckily, it took a full day to dry, so I was able to kind of move everything into position in the end. Once they were dry, I washed the sealant goo that was left on the marbles from my sticky fingers to give it a nice appearance. I now think that if I had slathered the jar with the sealant and left it alone for a couple of hours, then added the marbles, that might have worked better. I cannot be sure though, since I haven’t tried it. Once the jars were dry, I took the lids and the dowels and drilled holes in them. I connected the lids to the dowels with a screw. Then I placed the dowels in the garden where I wanted them (I had to use a hammer to really get it in the dirt) and add the glass jars on to the top. Don’t forget to add some treasure to yours first. That’s it. Woo hoo! I now have home made garden art. My kids have really loved having these in the garden too. They love checking them for goodies. So what do you think? Did I nail it or fail it? Will you be trying this craft? Or have you done it already? Let me know how it goes. I’d love to hear about it. If you want to make these yourself, I highly recommend following the Empress of Dirt’s tutorial. Place all the ingredients into a bucket and mix well until sudsy. You really want to make sure you dissolve the baking soda in the water so it doesn’t leave a cakey film on your floor. Mop the area with the solution. Enjoy your fresh smelling, clean floor! 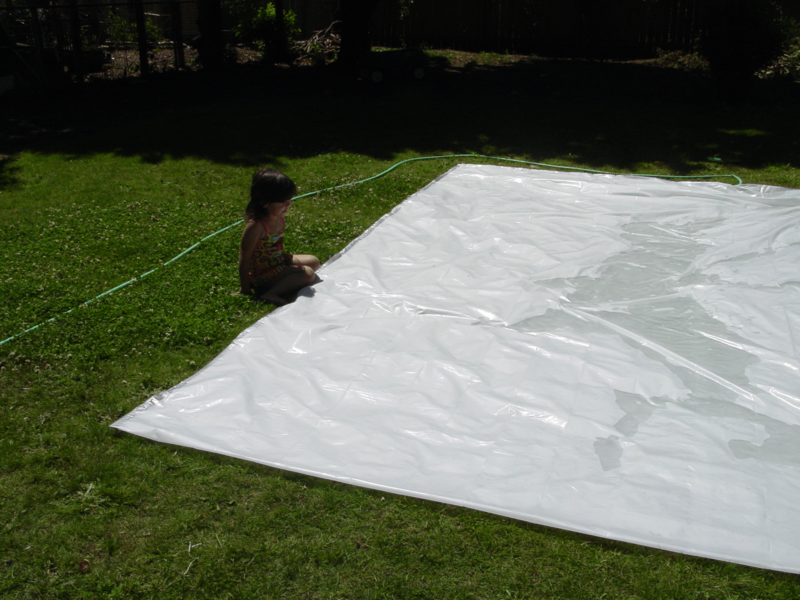 Do you have a favorite homemade floor solution? Please let us know in the comments section below. If you are in need of a good mop and bucket, this is the one that I use and I love it! 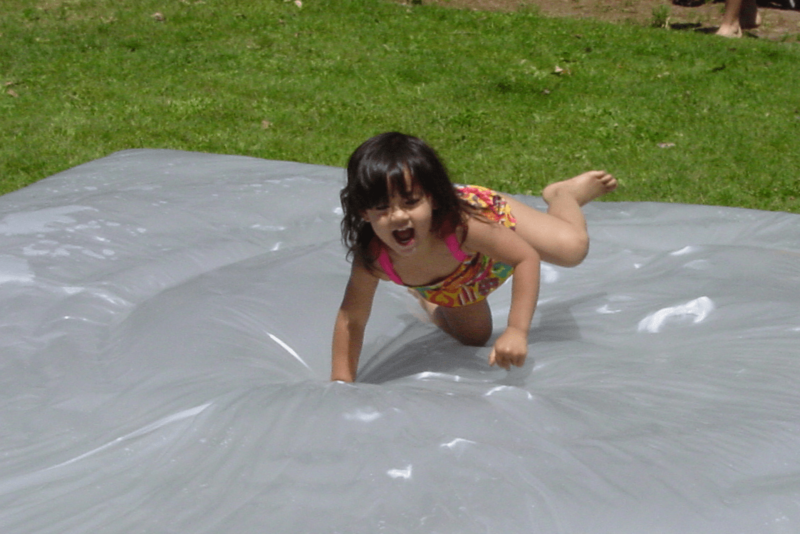 It allows you to wring it out without touching the dirty water and it’s so easy to get to all the hard to reach places. The pad is also machine washable. If you like this post, be sure to check out my other frugal tips. The first and least threatening of the tasks in my kitchen was the sink. Everyone loves to have a nice, clean, shiny sink. Right? Mine was pretty dull looking and had some rust stains. After looking through a few pins on Pinterest, it looked as though baking soda, vinegar, lemon and elbow grease were the way to go. I was inspired by this post with the method I was going to try. 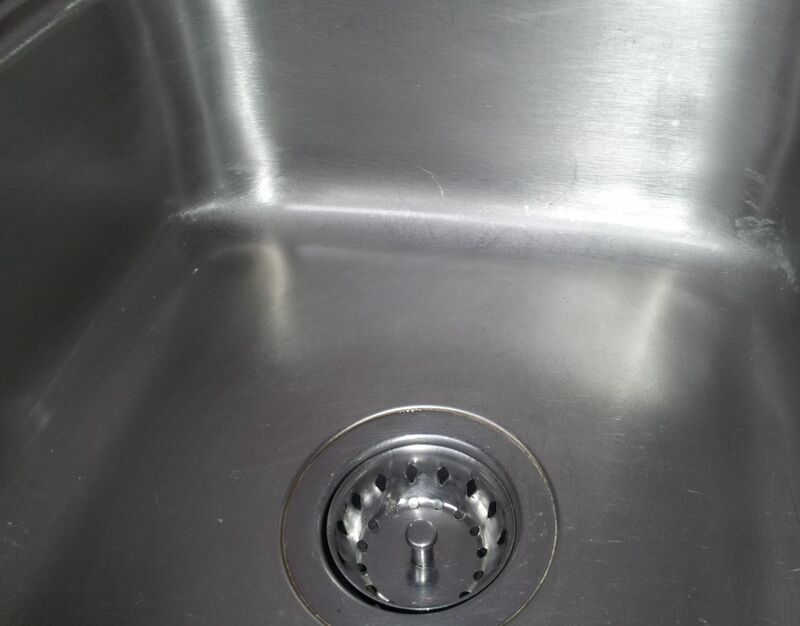 Well, if your sink is already pretty clean to begin with I would agree that these items will work, but I had some old rust stains on mine like the one pictured above. I tried the baking soda and vinegar first, but the rust wouldn’t come off. It was time to call in the big guns. So yes, I almost immediately turned from natural products and went for the Bar Keepers Friend. What can I say, it works! And, it doesn’t cost a whole lot for a bottle at Lowe’s. It was less than $3, if I remember right. As you can see, it took the rust right off. No problem. Now I can use baking soda, vinegar and lemon from here on out to keep it nice and shiny. Thrifty tip: Make your own Drano to cut the grease and keep your pipes flowing smoothly. I do this once a month. It’s kind of ironic that dishwashers, that clean your dishes get dirty, but they do. 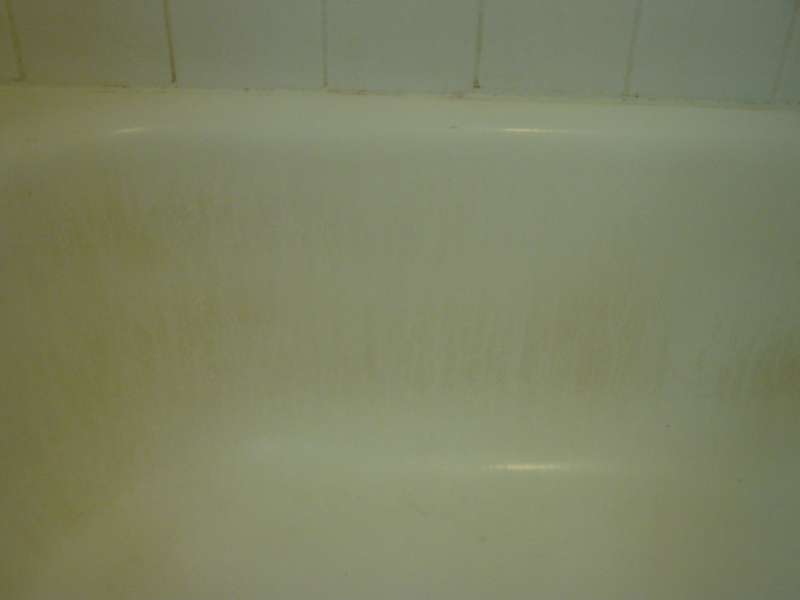 Anytime you have water going through something repeatedly you risk the chance of getting mold, like in your shower. 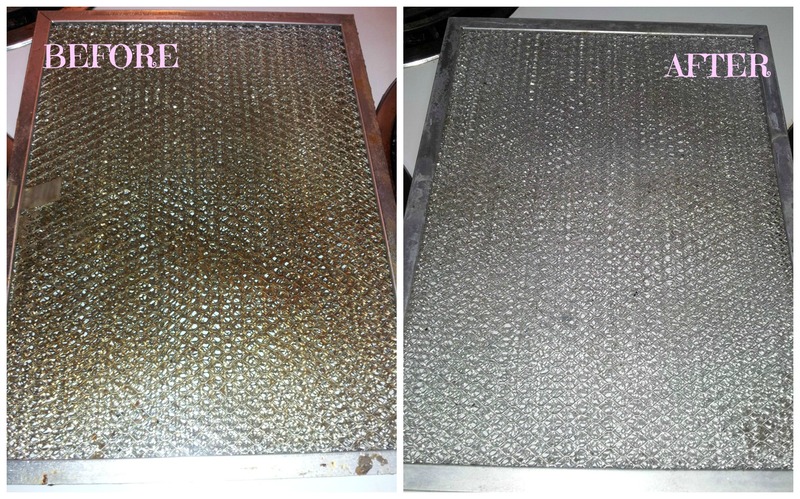 Dishwashers are prime targets for attracting mildew and mold. You also want to keep them clean so they will run properly. I know what you’re thinking right now. The before and after pictures don’t look much different. Don’t let the image fool you, there is a huge difference between these two pictures. I think the bottom rack in the before picture is hiding alot of the problem area. I was inspired by this post to clean the dishwasher and I followed her instructions as closely as possible. The dishwasher should be totally empty at this point. Take out the bottom rack and feel around the bottom for bits of plastic, or other things that may be lurking. 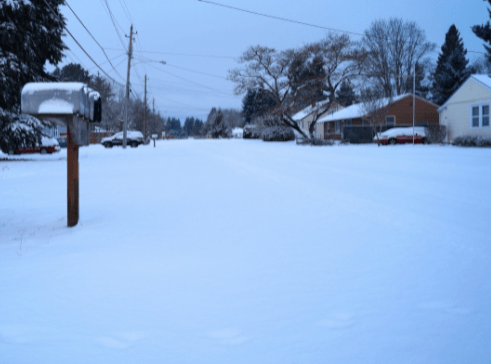 Wear gloves as there might be glass or other sharp objects down there. 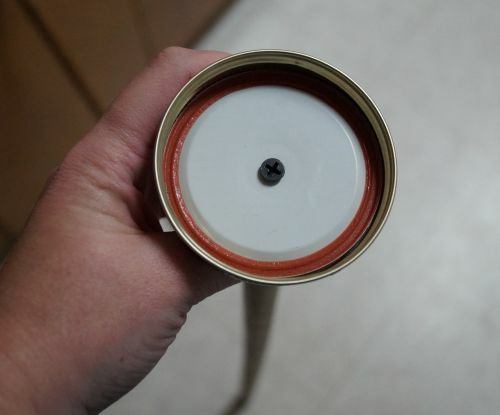 If your filter comes out, you can take it out and check it to see if it needs cleaned. Mine wouldn’t come out, or at least I couldn’t figure out how to get it out. Put the bottom rack back in when you are done. 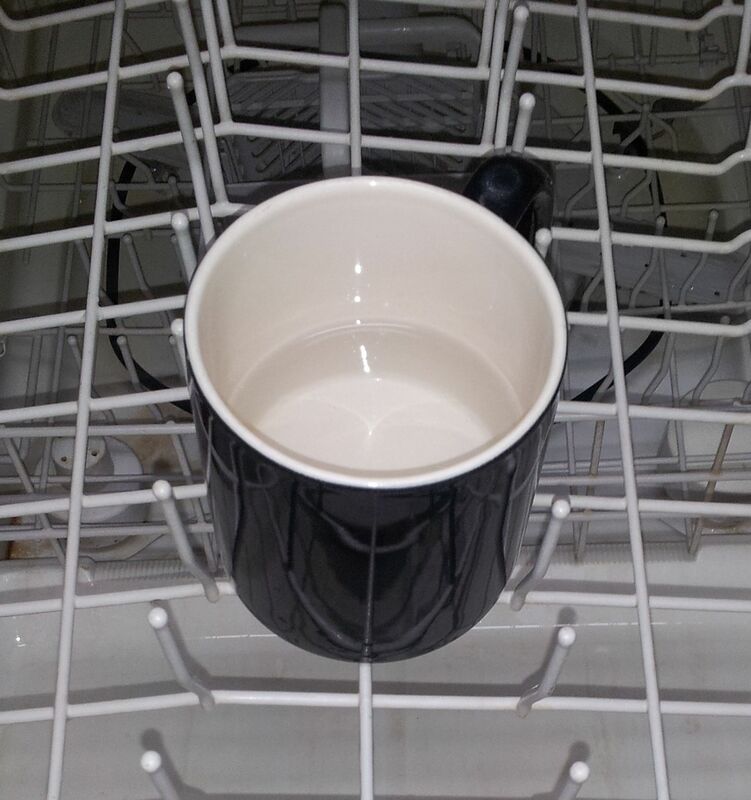 Fill a dishwasher safe cup with white vinegar and put it in the top rack. Run the dishwasher through a full cycle. 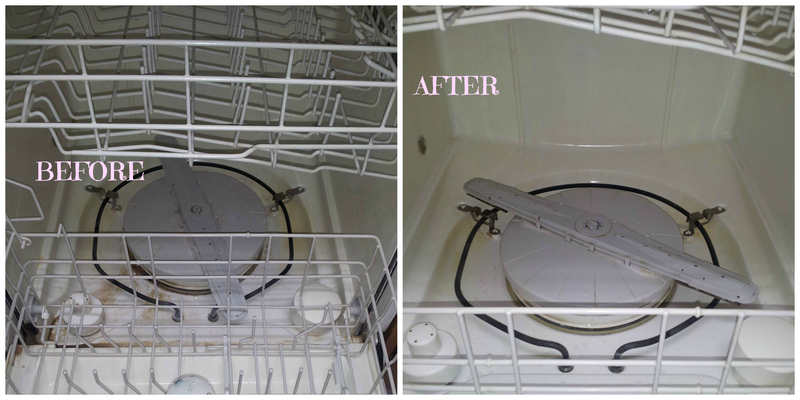 Sprinkle one cup of baking soda on the bottom and run again on the short cycle on the hottest setting. If you have mildew problems, you can add 1/2 cup – 1 cup of bleach to the bottom. That’s what I did. 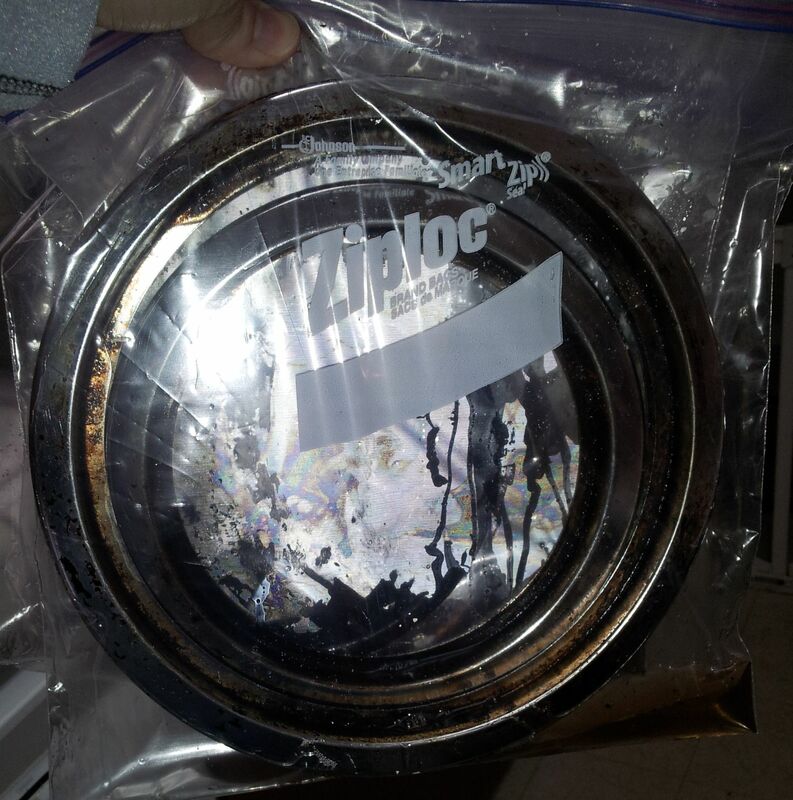 NOTE: DO NOT USE BLEACH IN YOUR DISHWASHER IF YOU HAVE A STAINLESS STEEL INTERIOR). You may be done at this point, if it looks clean, but if you have remaining gunk after both cycles have ended, you can scrub the problem areas with a scrubber or an old toothbrush. It should come right off. Run a rinse cycle and you should be good to go. 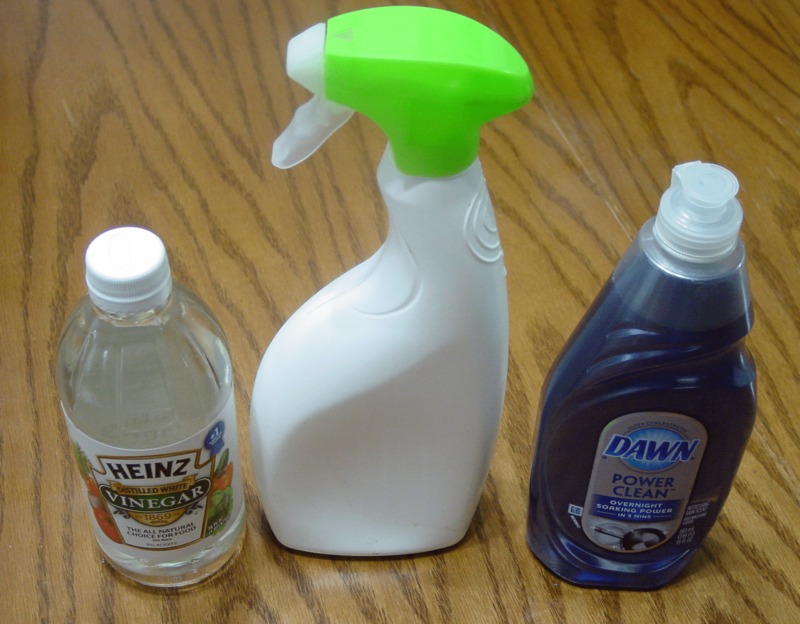 Thrifty tip: Fill your Rinse Aid holder with white vinegar. It works better than actual rinse aid, in my opinion and it’s cheaper too. 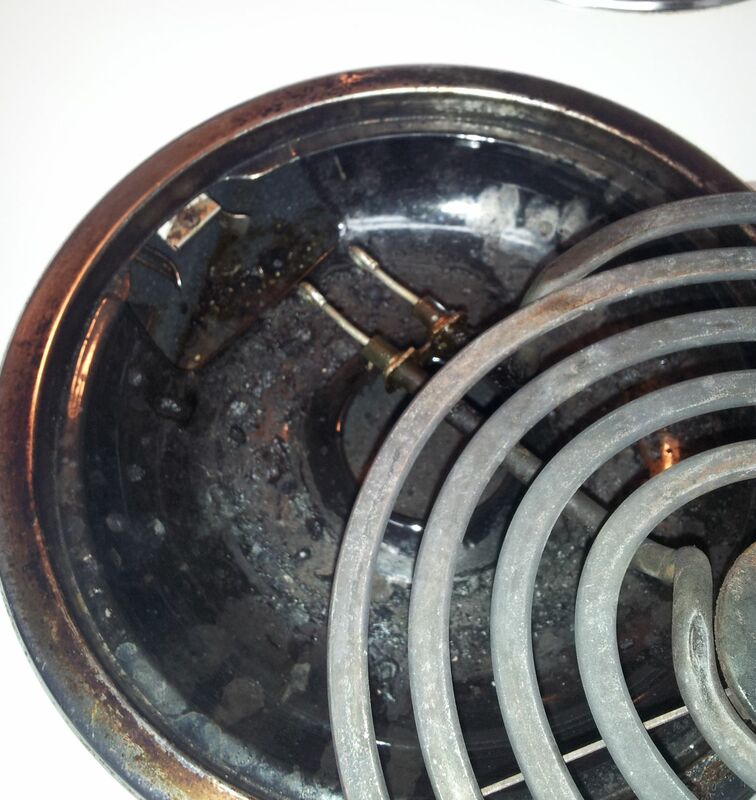 While I was immensely grateful that our house came with a stove, I was afraid to clean what was lurking inside. I don’t know what year it was purchased, but it had caked on, baked on crust that I have not been in the mood to deal with. The pictures don’t quite do it justice. It was gnarly! I did not want to use oven cleaner, so I looked for another way. 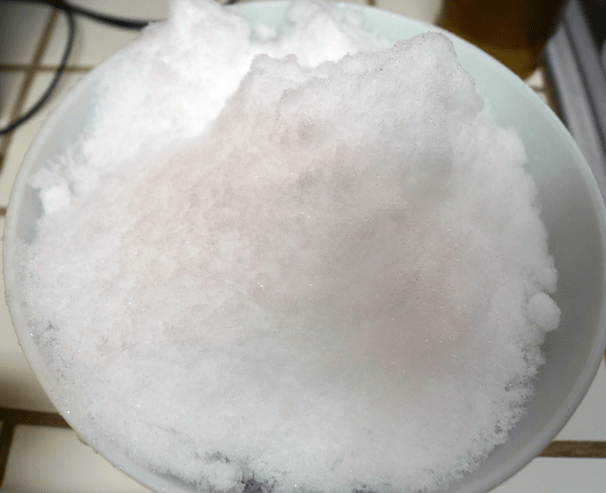 I was inspired by this post to try baking soda and some other items to make a concoction that was supposed to cut through the nasty stuff with ease. But before I started on that, I took out the oven racks, placed them in a garbage bag and poured about 1/2 cup of ammonia in it. I tied it up and took it outside to brew overnight. (Plan to use the stove top burners for dinner or get takeout if you do this.) Ammonia does stink like pee, so just be warned. And never, ever, ever mix ammonia and bleach together! The ammonia doesn’t need to soak the racks, but it somehow works to de-junk the racks without touching them. It must be the smell. Blah. I took them out the next day and washed them in the tub. I held my breath and used a scrubby sponge on it and the gunk just fell right off. 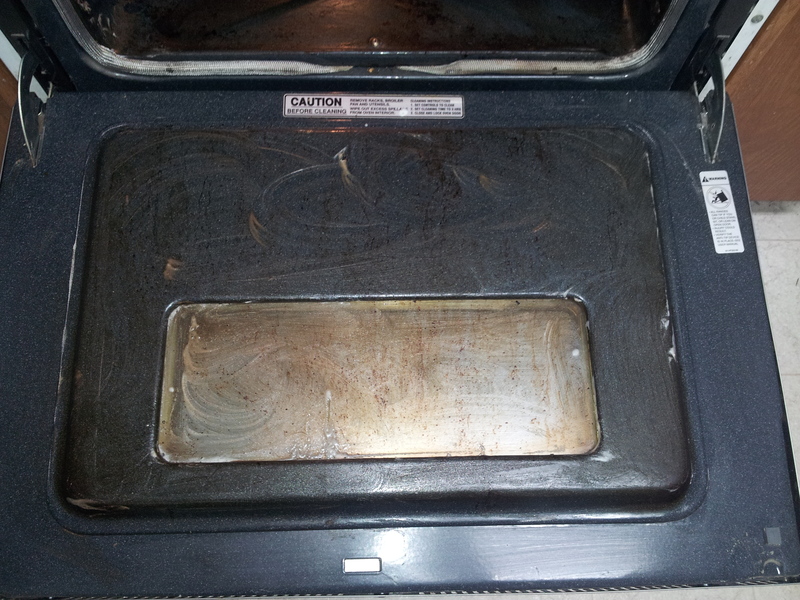 Next came the inside of the oven. For this you will want to mix up 5 T baking soda, 5 drops of Dawn and 4 T vinegar. Then mix into a paste. The vinegar will make it foam a little. Spread all around the inside of your oven and on the door. Then prepare to scrub your arms off. You can let it sit for a few minutes, but really, I don’t think this does a whole lot. The power is in the scrubbing. I had to use this mixture twice over and probably could have done another round, but eh. My arms and fingers were hurting after two times. 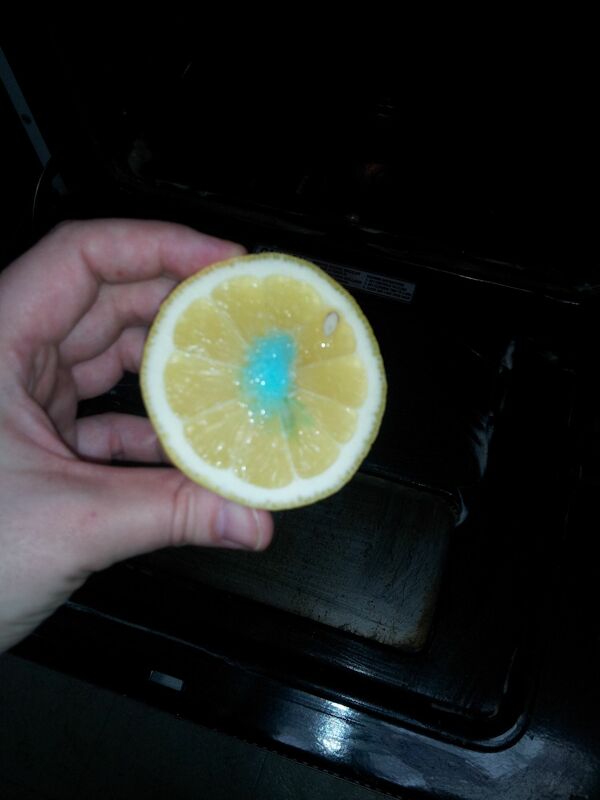 You can use half a lemon with a few drops of Dawn soap on it for some extra cleaning power. After you’ve scrubbed it to the best of your ability, it’s time to clean up. Wipe up all the junk with a cloth and water. I kept a water bucket nearby so I could easily rinse it. The baking soda may leave some white streaks when it dries, but just go over it with a wet cloth and it should go away. As you can see, this mixture did work pretty well. There was still a bit of baked on stuff, but it’s nothing I can’t live with. The gunk you see on the glass is actually on the inside. 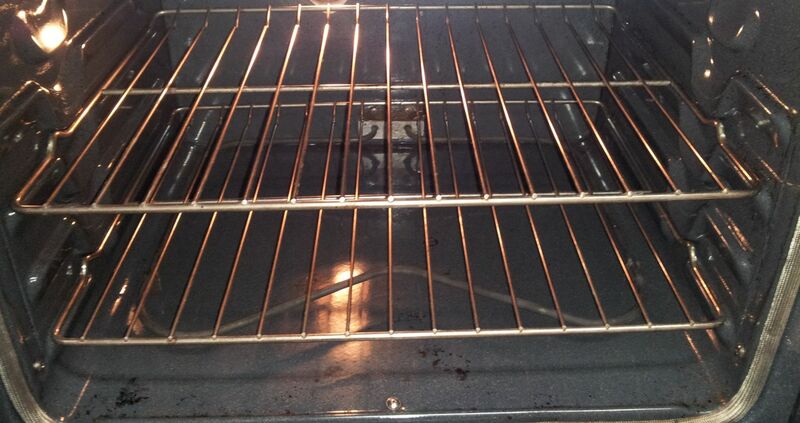 Some of you might be able to use this trick to get the inside of the glass clean, but my stove isn’t made that way. All in all, I was pretty happy with this method. The only harsh smell was the ammonia and that was for a very miniscule amount of time. I do believe I will keep doing it this way for the rest of my life. Get the biggest pot you have and fill it with water. Turn it up to high heat and bring it to a boil. 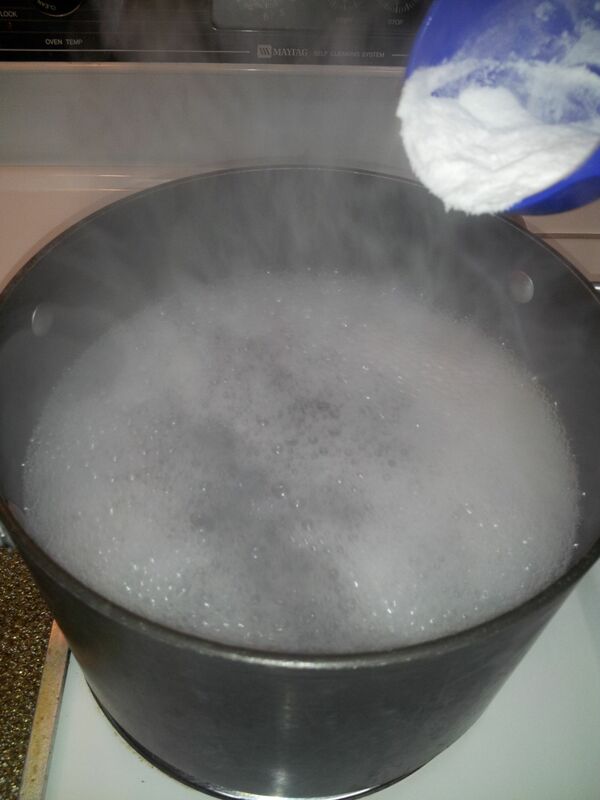 Once the water is boiling, slowly pour in 1/2 cup of baking soda. It will make the water fizz, so pour very slowly. 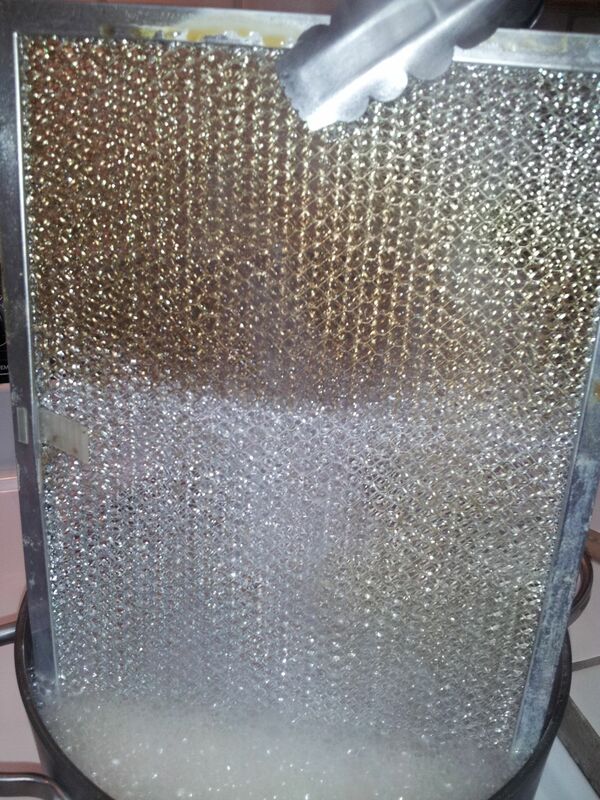 Take your vent filter and put as much of it as you can in the boiling water. Let it boil for a few minutes. Next, use some sort of tongs to lift the filter out to turn it to the other side. The filter will be hot, so make sure you don’t touch it. At this point, you should be amazed by the half clean, half dirty filter. After a few more minutes of boiling, you should be set to take out the filter. You can rinse it under the sink for another minute until the water runs clear. Stand the filter up somewhere while it dries. Once you’re done with that, the underside of your stove hood should have alot of condensation built up from the boiling water. Wipe this down with a rag until it’s clean. It should all just wipe right off. 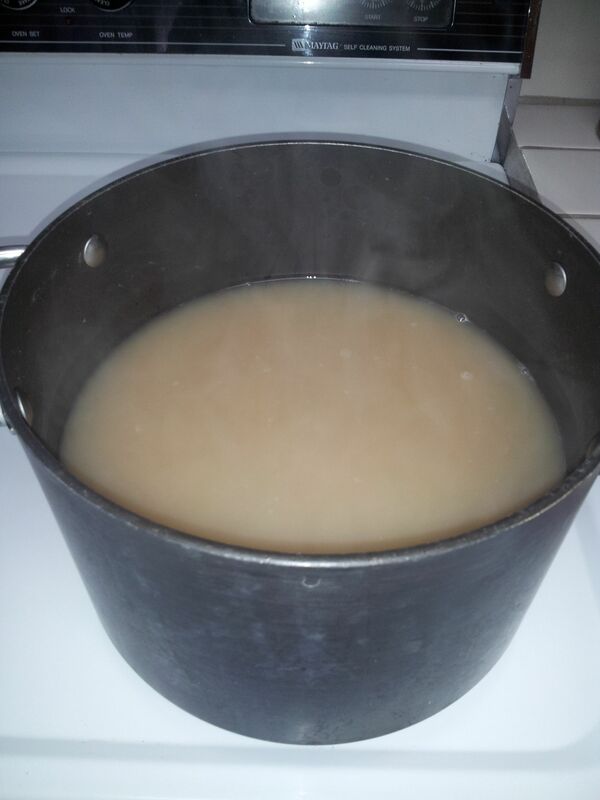 Ok, so this is totally gross, but this was the water that was left in the pot after I washed the filter. 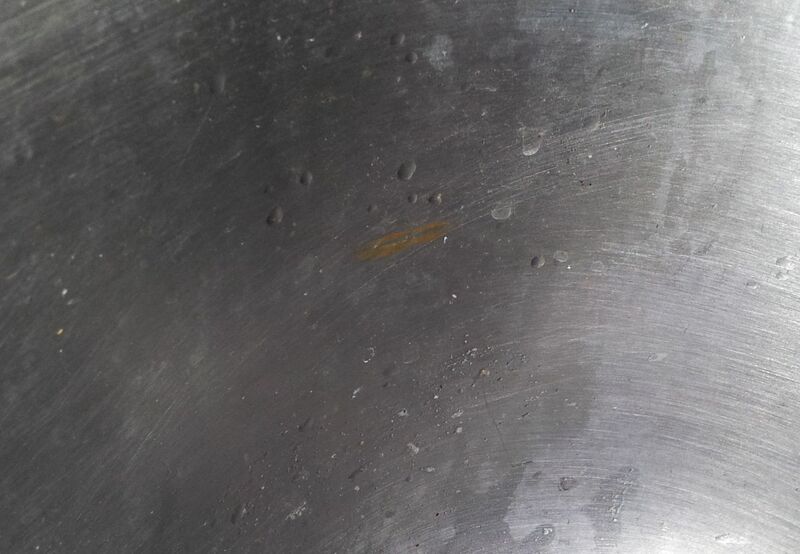 If your water looks like this, you will want to dump it outside, not down the sink. The pot should come clean with Dawn soap and water. Next came the top of the stove. The biggest problem I was facing here were the metal rings. Ugh. I decided to go the ammonia route again, since it worked so well with the oven racks. This time I just used a large ziploc (one ring per bag) and poured a bit of ammonia in. Once they were sealed they went outside overnight. 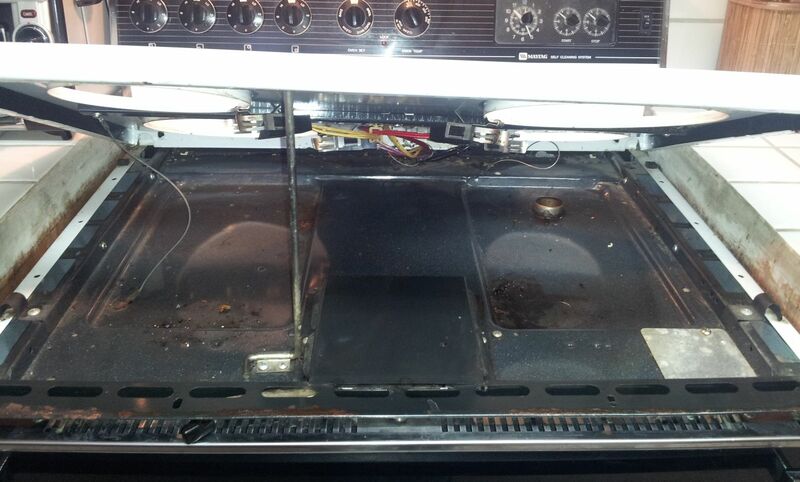 Next, I wiped down the whole top of the stove and then lifted up the hood and cleaned under the burner area. It’s kind of like working on a car, huh? Just use the same baking soda concoction you used inside the oven. It’s the same type of surface. 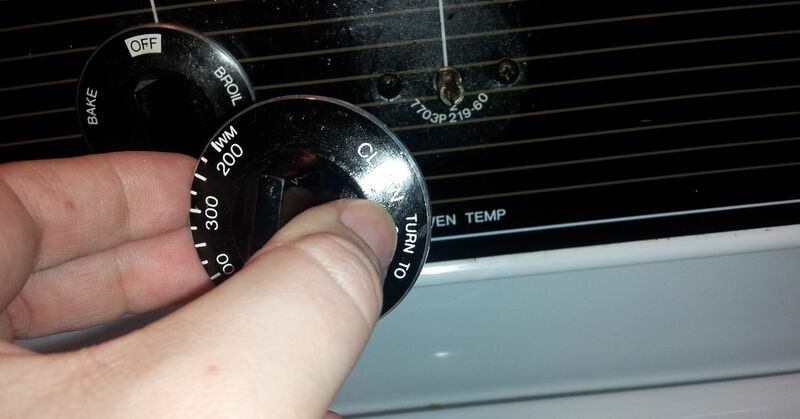 Then I decided to get the top of the stove clean, the knobs and such. I had never taken them off before and it was obvious that no one probably ever had. It was all so greasy. At this point, I had used up two boxes of baking soda from the previous tasks, so I was fresh out. I didn’t want to run to the store, so I used plain ol’ white vinegar. I rubbed it on each knob and the length of the stove where the knobs were and lo and behold the grease came off. It was actually pretty sparkly when I was done. The next day, when I pulled out the rings and scrubbed them slightly, they came pretty clean. 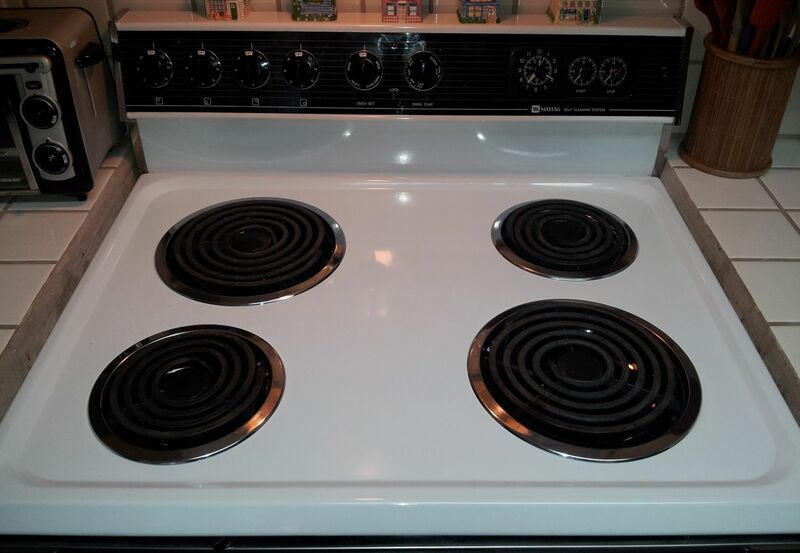 They probably could have sat longer to get cleaner, but I wanted to cook with the stove top. I decided they were clean enough since the part of the ring that is exposed looks new. 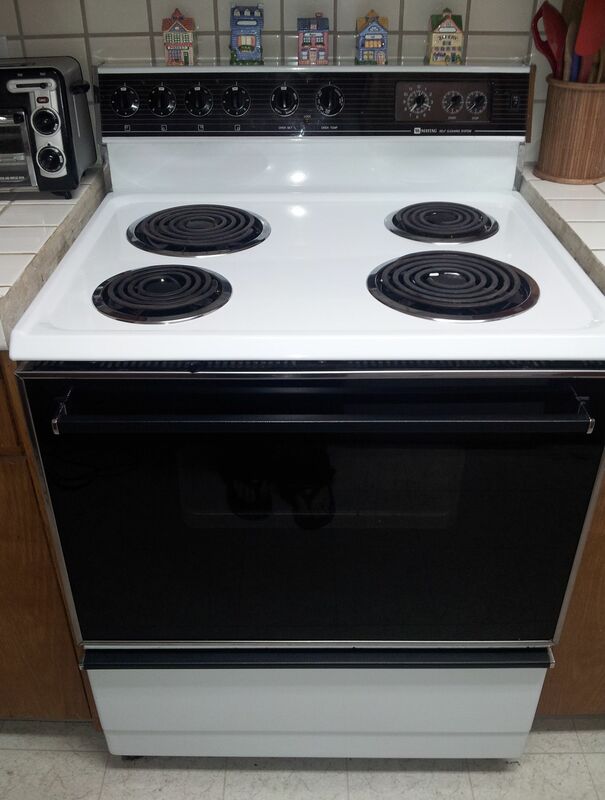 Here is the finished stove in all of it’s glory. It was so clean I could see my reflection. Yeah! 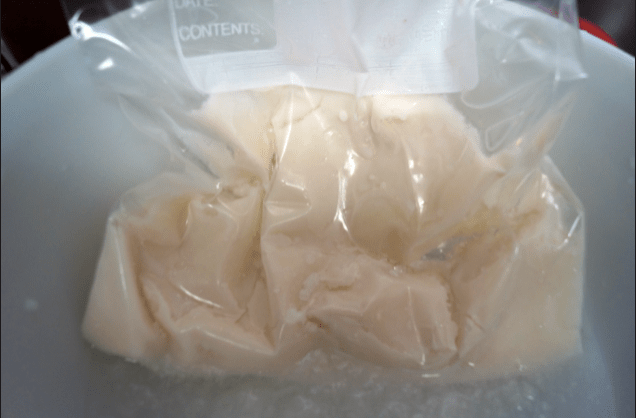 I did a bit more than I could show you in this post, seeing as how it’s already so long, but that should be enough to get you started on a week long kitchen cleaning rampage. 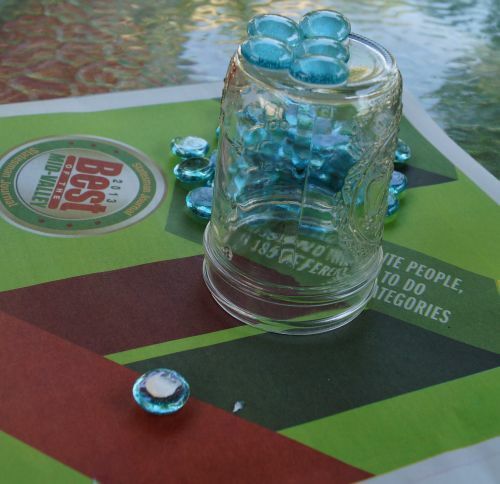 Don’t forget to check out the other posts in the NW Bloggers Spring Cleaning Bash. These will help motivate you to get cleaning in other areas of your house too. Happy cleaning! I interrupt the 21 Day Declutter Challenge to bring you this special report. I was getting ready to go on in the challenge today, until I realized the sink in our main bathroom is getting clogged. Instead of running down to the store and spending $6-$7 on a bottle of Drano, I decided to do a little Googling to see if there were any Homemade Drano Recipes. Google did not fail me today. 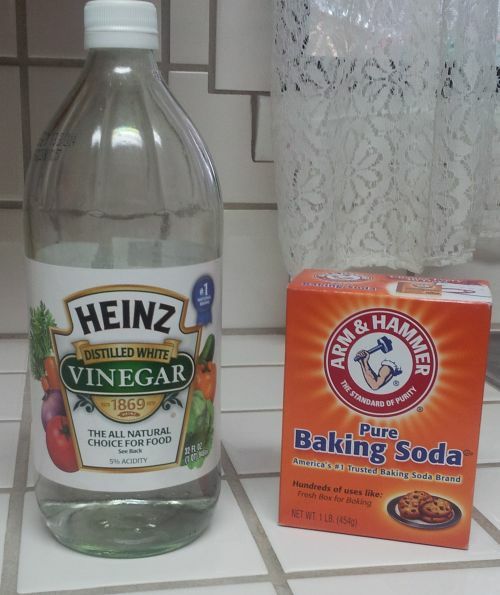 I found this great homemade Drano recipe which uses some of my favorite cleaning ingredients, vinegar, baking soda and water. Helpful hint: You kind of want to plug the drain with the baking soda so that when the vinegar makes it fizz, it will be forced down the pipe and not up. 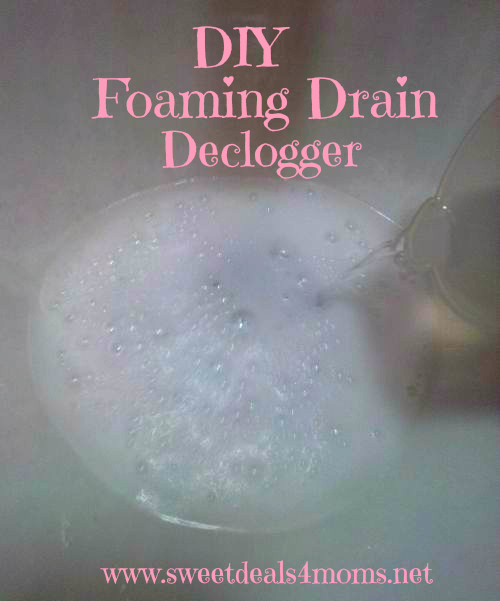 Depending on how bad your clog is, you might need to do this more than once. I had to do it twice for the clog in my sink. That’s it! Good luck. I like having a clean house, really I do, but sometimes, I don’t like putting in the hard work required to get certain things clean, like the tub and shower. Let’s just say the whole bathroom in general is not my favorite place to clean. If I can find a way to work smarter and not harder (like the microwave cleaning trick), that’s the route I’d prefer to take. So I found an interesting solution once again from Pinterest, on how to clean the tub and shower with ease by making your own Homemade Tub & Shower Cleaner. 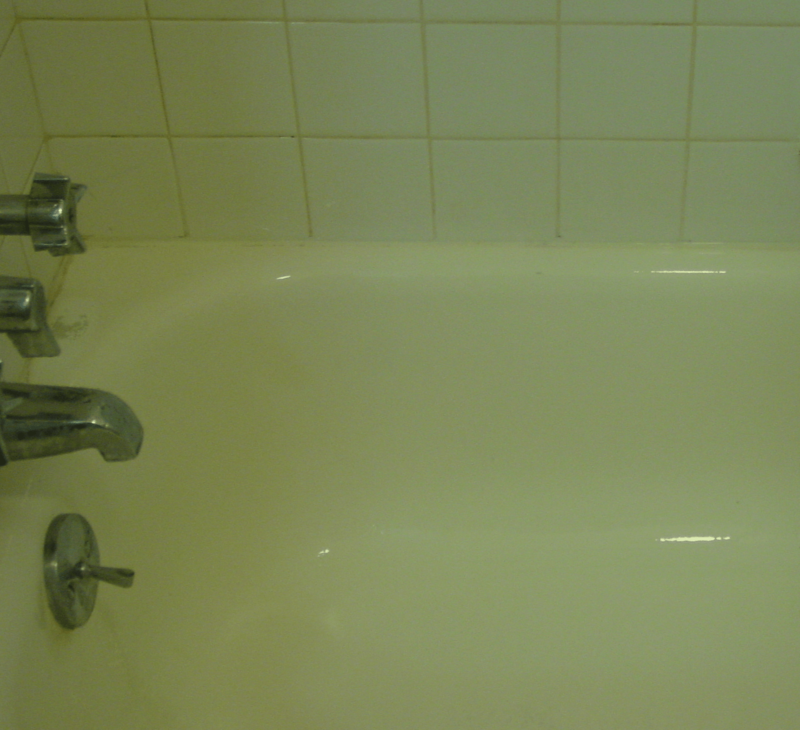 I’m ashamed to show you this, but this is my tub before I used this cleaner. It’s BAD. The worst part about it is that I did actually try to clean it a few days before with actual tub cleaner, the stuff just wouldn’t come off! Once I made this homemade concoction out of vinegar and Dawn, I sprayed it on and waited 10 or 15 minutes. I should have waited longer, but I was eagerly anticipating it’s magic. Once I started scrubbing, all of the gunk was just coming right off without a problem. There were still a couple spots that were still not coming off close to the faucet, but next time I will just let it sit for an hour or two before scrubbing. I’m so excited that it works! One empty spray bottle. I used a 24oz. White Vinegar. I used 12oz. 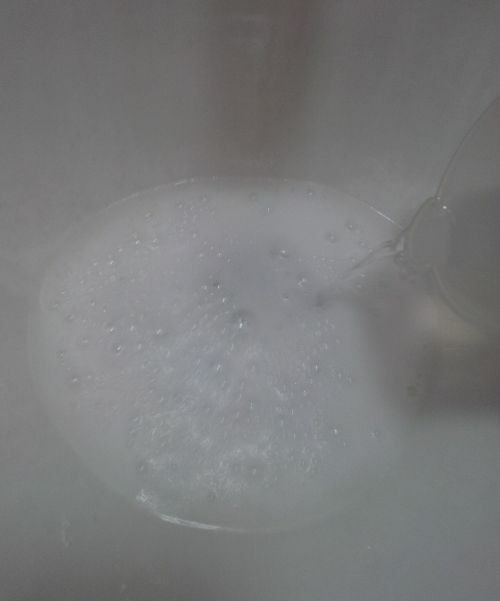 Liquid Dawn Soap. I used 12oz. I imagine you can use smaller portions as long as they are equal amounts. Step 1 – Heat the vinegar in the microwave until it’s hot (approx 45 sec – 1 min) and pour into squirt bottle. Step 2 – Add the Dawn soap and put the lid on. Gently shake the bottle to mix. 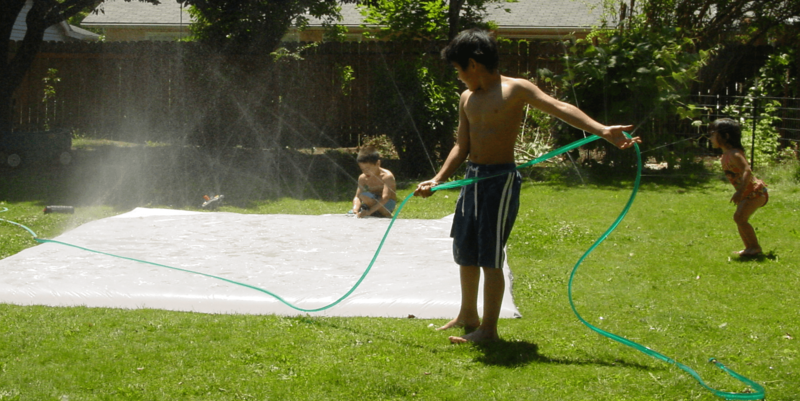 Step 3 – Spray away. Wait a few minutes and then scrub. You won’t believe your eyes. I would seriously compare this to an industrial strength all purpose cleaner. Don’t be surprised if you find all sorts of things to clean after you make it. After I cleaned the tub, I decided to clean out the cooler we had used to go to the beach. It worked like a charm. Since I was already outside with the cooler, I noticed some dirty siding on our house that I had been having trouble getting clean. Guess what? The dirt came right off. No joke. I wish I had taken before and after pics of it. From there, it progressed into a full on cleaning frenzy. 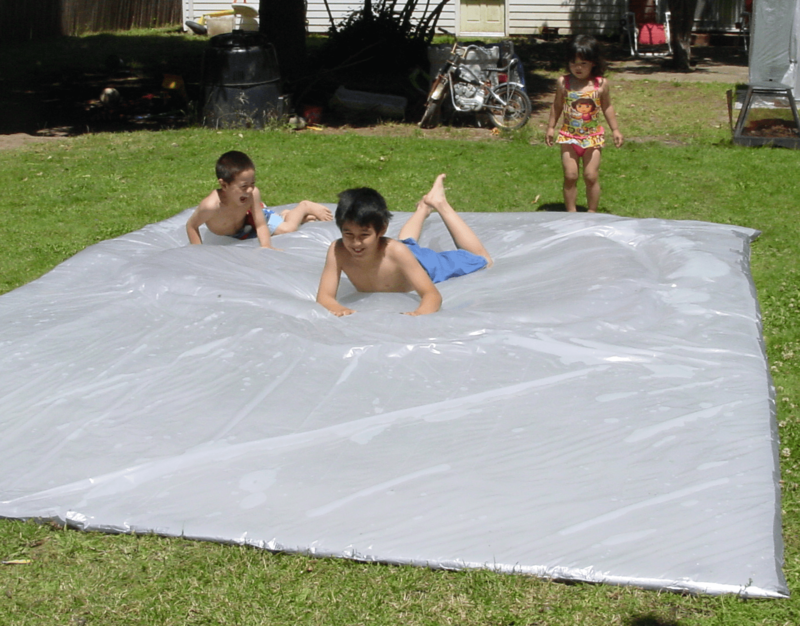 I was using a watered down version of it on a cloth and wiping down the fridge and dirty smudges on walls. It was better than a magic eraser I’m telling you. But enough of my rambling, go ahead and try it for yourself and tell me how it works for you. One of the ways I’ve found to stretch my dollars is to make my own yogurt in a crockpot. Yep. It really does work. It’s not quite as thick as what you buy at the store, but it’s still very yogurtey (is that even a word?) and the best part is that you know what’s in it and you can sweeten it however you see fit (ex: sugar, honey, agave nectar, fruit). 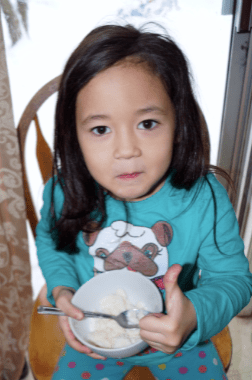 The nice thing about yogurt is that it is a very versatile food. Some of the many ways you can use yogurt are in homemade salad dressing, frozen fruit pops, smoothies, you can coat chicken with it before dipping in breadcrumbs to bake and of course, you can just eat it with some fruit added. 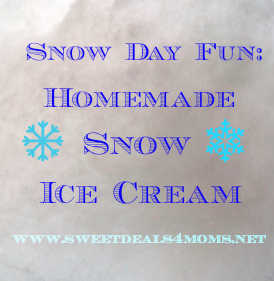 I’m sure there are many other great ways to include yogurt in your everyday recipes. Let me know your faves. 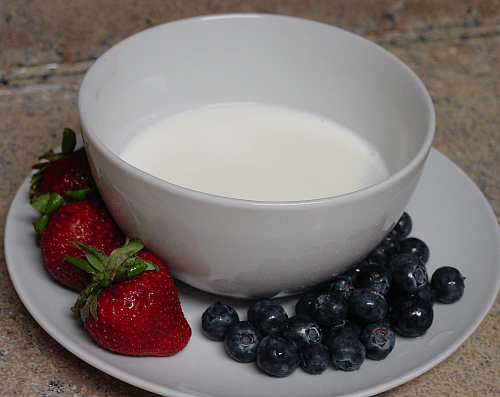 To make the yogurt you will need a crockpot, 1/2 gallon of whole organic milk and 1/2 cup of plain natural yogurt (to use as a starter). 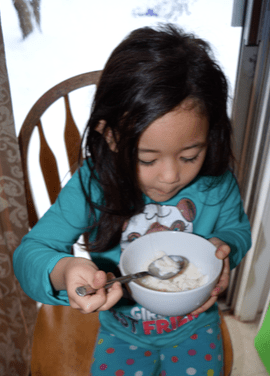 The process of yogurt making is really simple, but time consuming, so make sure to try this on a day when you will be home all day. 1. 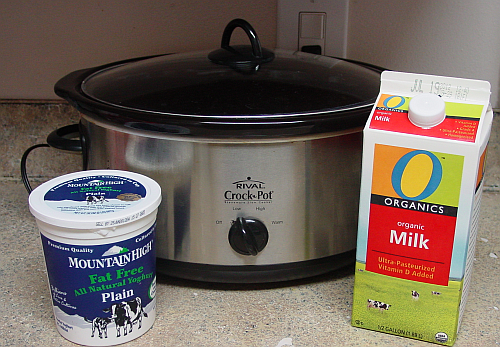 Pour 1/2 gallon whole organic milk into the crock put. Cover and heat on low for 2 1/2 hours. 2. Turn off or unplug your crockpot. Let it sit for 3 hours. 3. 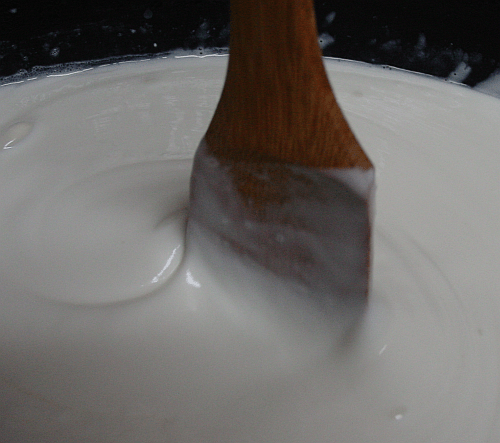 After three hours, take 2 cups of the hot milk and put in a bowl. 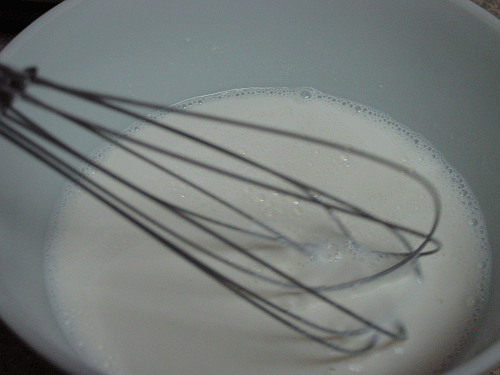 Mix in 1/2 cup of plain natural yogurt in with a whisk. Then pour the mixture into the crockpot and stir. Replace crockpot lid. 4. 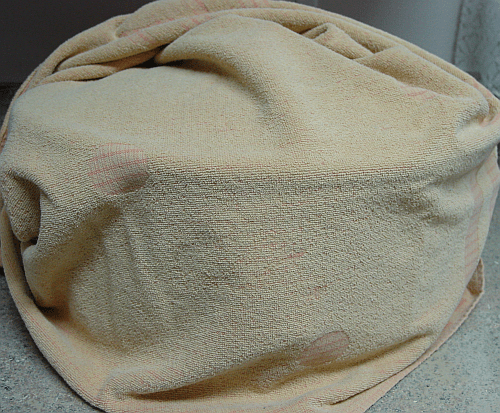 Cover your crockpot with a heavy towel or blanket for insulation. Let it sit for 8 hours. 5. After 8 hours have passed, it’s time to see what you made. Pretty nifty, eh? Separate into plastic containers and chill. This yogurt will keep for about 5-7 days. Be sure to save 1/2 cup to make your next batch. Enjoy!